EAST HAVEN, Conn. (AP) — A small plane crashed into a residential neighborhood a few blocks from an airport while trying to land, setting fire to two houses and likely killing up to six people, authorities said. 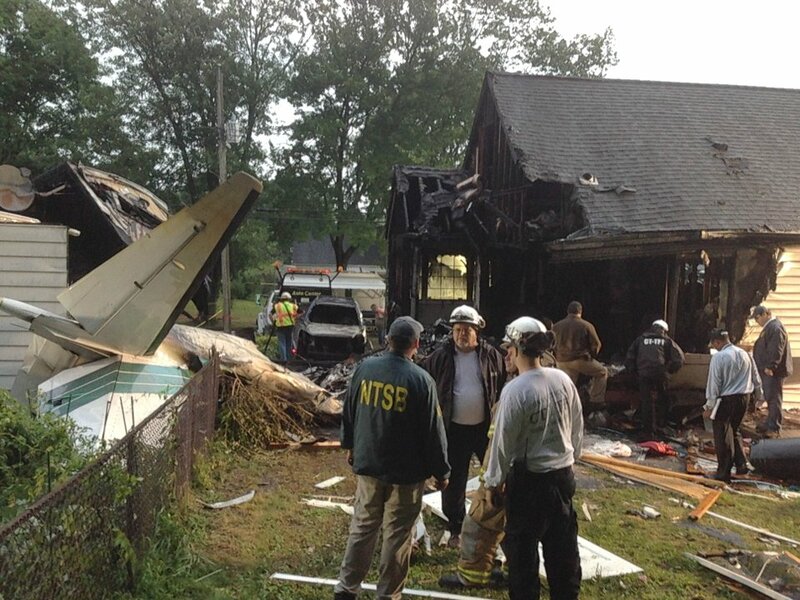 Just before noon Friday, the multi-engine, propeller-driven plane struck two small homes near Tweed New Haven Airport. The aircraft's left wing lodged in one house and its right wing in the other. Late Friday, officials from a number of agencies were still at the scene trying to determine how many people had been killed. Officials said the total was between four and six. The victims of the crash have not been identified. "We haven't recovered anybody at this point, and we presume there is going to be a very bad outcome," East Haven fire Chief Douglas Jackson said Friday. Plane Crash, 6 feared dead. yahoo image. National Transportation Safety Board investigator Robert Gretz said at a news conference Friday night there were casualty reports of two or three people in the plane and two or three people in one of the homes. He said the reports were unconfirmed and that local and state authorities were at the scene looking for victims.Shortly after the crash, officials had said at least three people were missing: the pilot and two children, ages 1 and 13, in one of the houses. Later, Gov. Dannel P. Malloy said the plane also may have been carrying two passengers. However, officials were still trying to verify whether that was true. Less than two hours later, Malloy said rescuers had spotted two bodies, including one of an adult, but hadn't recovered them. The plane's fuselage had entered one of the houses, and the recovery effort was focusing on the home's basement, he said. Mayor Joseph Maturo Jr. said later that the houses were still unstable and crews had not completed a full search. The 10-seater plane, a Rockwell International Turbo Commander 690B, flew out of Teterboro Airport in New Jersey and crashed at 11:25 a.m., the Federal Aviation Administration said. Tweed's airport manager, Lori Hoffman-Soares, said the pilot had been in communication with air traffic control and hadn't issued any distress calls. "All we know is that it missed the approach and continued on," she said. A neighbor, David Esposito, said he heard a loud noise and then a thump: "No engine noise, nothing." "A woman was screaming her kids were in there," he said. Esposito, a retired teacher, said he ran into the upstairs of the house, where the woman believed her children were, but couldn't find them after frantically searching a crib and closets. He returned downstairs to search some more, but he dragged the woman out when the flames became too strong. Wilson Idrovo said he was working on a house nearby when his son said: "Daddy, the airplane is falling down. "Idrovo said he went into the house but couldn't get into a room where the plane had crashed. Angela Wordie was on her deck taking in towels when she noticed a plane making a strange sound. "It kind of was gliding," she said. "The next thing I know it hit the house." Maturo, the mayor, said a priest was with the woman whose children were feared dead, and he offered sympathy to the family. "It's total devastation in the back of the home," he said.